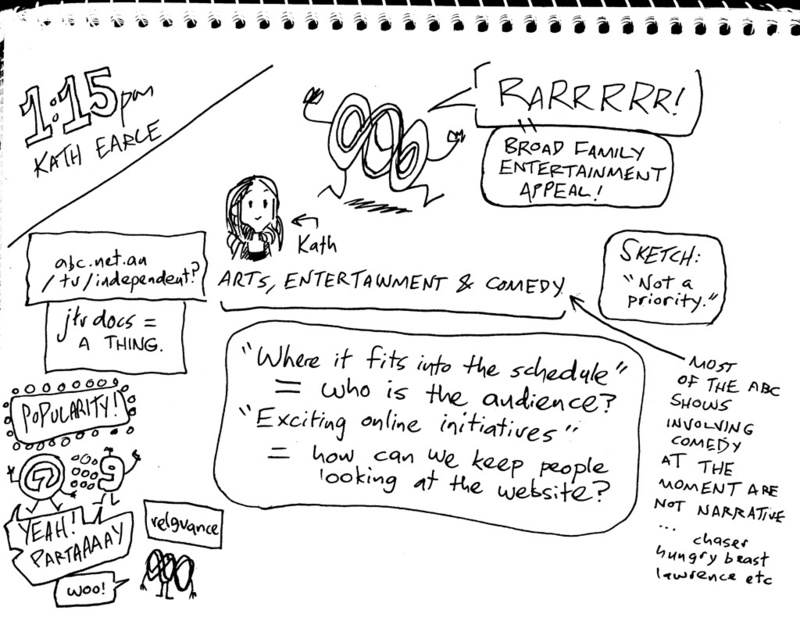 I attended SPAA Fringe a few weeks back. SPAA Fringe is a conference run by SPAA (Screen Producers Association of Australia) which doesn’t cost too much to attend and features interesting talks by various knowledgeable people in the entertainment industry. There is also the chance for shlubs like myself and my co-writer, Adam, to sit at roundtable discussions with some of these people. We did this, and two of the people leading the discussions were from ABC-TV — Debbie Lee (Head of Comedy) and Kath Earle (Executive Producer, Arts, Entertainment & Comedy). I took notes at these chats and thought I’d pop them online for all of our amusement. 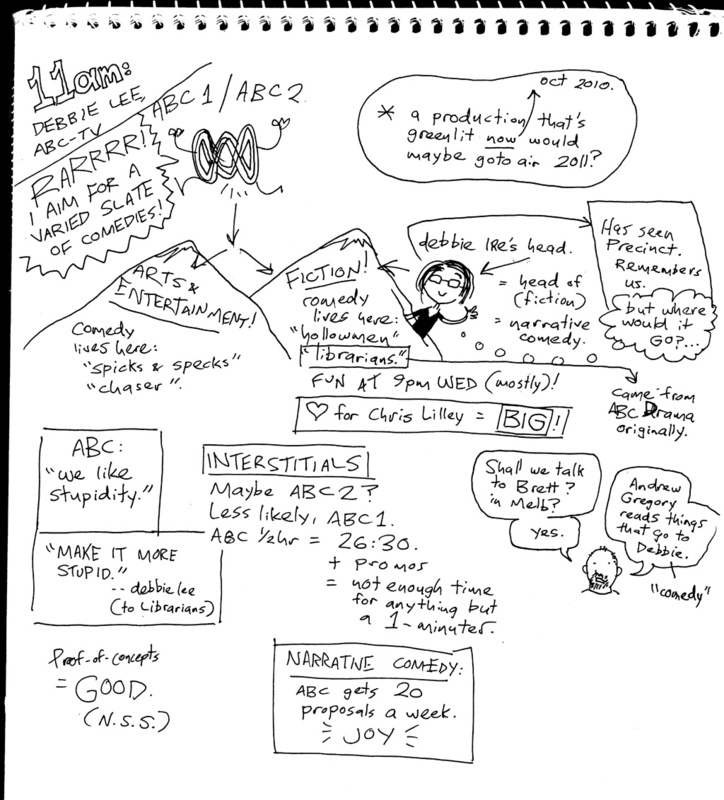 If you have any knowledge of the ABC and what they do there, you may not learn anything from my scribbles, but since I don’t know squat about squat, and what I DO know I forget very quickly, I had a couple of “aha!” moments. 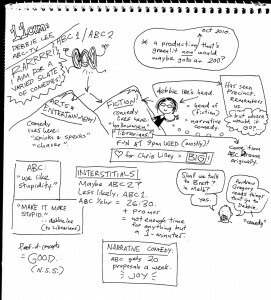 Something I hadn’t thought about before was that the ABC has a “narrative” stream of comedy programs and the “Arts, Entertainment & Comedy” (non-narrative) stream. The vast majority of ABC’s comedic shows are non-narrative. 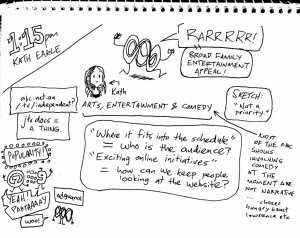 We’ve submitted The Precinct as a show concept in the past, and Debbie remembered it, but (apologetically, I thought) explained that the ABC doesn’t have a place for a half-hour animated comedy for adults. Well, not ours. Well, not in that format, anyway. When I get a chance I’m going to pitch them on some of our short-form ideas. What I took away from the talks was: if I ever come up with a good idea for a show with broad family appeal that is cheap to make, the ABC wants to hear about it. In the meantime, all I have are ideas for silly adult cartoons with “cult” appeal — which is why the SBS roundtable we were part of was so interesting. Might post the notes I took at that session too. Thanks to SPAA Fringe for the excellent conference, and to Debbie and Kath for being there to share some useful insight with us! As Big As The Simpsons! New Precinct cartoon: BE A MAN!